Giving back to he community is part of my business, says Sonya Moulang, who has been running Queen Street cafe Bar Centrale for two years. Every Tuesday, kitchen staff at Queen Street café Bar Centrale cook 25 meals that will feed local homeless people. A group called We Are Community pick up the meals and deliver them as part of their Night Patrol service, which runs from Glenfield to Camden. But as café owner Sonya Moulang explains, cooking meals for the homeless is just one of the many community activities she and her team are involved in. “It’s become such a big part of us, we do heaps of different workshops , poetry slam is coming, macramé, book clubs, anything that will bring everyone together and getting them talking,’’ she says. While Ms Moulang ensures the main focus is on her core business – hospitality – running an ethical and community minded café is also very important to her. Bar Centrale also does a lot of recycling, with all their used cans going to charity, coffee grounds given away to mushroom workshops and plastic straws have been given their marching orders. “When it comes to the hospitality side of the business the focus is on fresh produce, on great food, that is the main core of us,’’ she says. “But the community side of things, I can’t do one without the other. “This is part of me, who I am. “I’m big into volunteering, I’ve been with the SES for five years and with youth clubs. “That’s where it all comes from, that community spirit,’’ she says. If you visit the Bar Centrale Facebook page, you will see that at the moment posts about one particular community initiative are dominating. 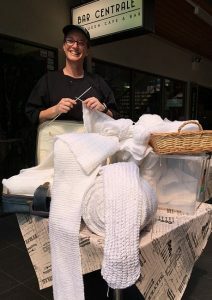 It’s an attempt to set a new Guinness Book of Records for the longest awareness white ribbon every knitted anywhere in the world, as part of White Ribbon day on November 23. It started out in the Taree police command, and Campbelltown and Macarthur, through Sonya Moulang and Bar Centrale, are playing a pivotal part. The aim is to beat the current record set in the USA of 2,424.11 metres. It doesn’t sound like a lot, but more than 200 metres have been knitted here, thanks to Ms Moulang, who has not wasted an opportunity to enlist knitters, skilled or otherwise. “It’s not a lot but it’s not bad for a little café,’’ she says. Recently Campbelltown Council had a function in Bar Centrale and before they could leave Ms Moulang prevailed on general manager Lindy Deitz and Mayor George Brticevic to stay back and do a bit of knitting for the cause (pictured left). “They were more than happy to help out; Lindy did a couple of rows,’’ says Ms Moulang. 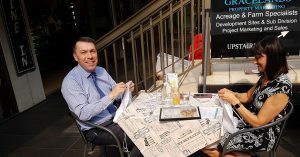 And then there was a recent Campbelltown business chamber function called First Friday drinks where she had chamber directors and members knitting or trying to. “About 20 people had a go and we got a couple of rows, but it was also about engagement and community fun,’’ Ms Moulang says. The deadline is fast coming up, so Campbelltown is set to add a few more metres of ribbon to the effort. Before taking over the running of Bar Centrale a little over two years ago, Sonya Moulang was like most people – working for someone else. “I worked in hospitality in many forms, including managing other people’s business, but everyone wants to be their own boss, I guess,’’ she says.